Delles Everett Carter, Jr. (December 8, 2009) | Burmeister-Johannsen Funeral Home, Inc.
Delles Everett Carter, Jr., son of Delles Everett and Anna Almira (Wright) Carter, Sr., was born on May 3, 1945, on the family farm in rural Defiance, Iowa. He attended Irwin (Iowa) schools and graduated from Irwin High School in 1964. He farmed and shelled corn with his father, and moved to the farm on 1973; he raised his four daughters there. In 1992, Jr. started driving truck for Reilly Construction, Ossian, Iowa; he continued at this job until poor health forced his retirement in November, 2008. On January 3, 2009, in Irwin, Jr. married Margaret (Midge) Ruth Cadwell. 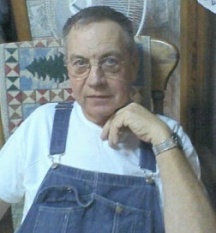 A Farm Bureau member, Jr. loved farming, especially corn shelling, and was a good welder. He was a wonderful friend and neighbor. Jr. enjoyed participating in antique tractor pulls and visiting at Knudson Service in Irwin. He took great pleasure in cooking and trying new recipes, and enjoyed doing BBQ for area events. Jr. also liked to spend time fishing, camping, bird watching, and riding his 1948 Harley Davidson motorcycle. Delles E. Carter, Jr., died on Tuesday, December 8, 2009, on the family farm in rural Defiance, Iowa, having reached the age of 64 years, 7 months, and 5 days. Jr. was preceded in death by his parents and one sister, Delene Bock. He is survived by his wife, Midge Carter of Defiance, Iowa; four daughters, Michelle (Paul) Plumb of Spirit Lake, Iowa, Christie (Jack) Knudson of Irwin, Iowa; Robyn Carter of Omaha, Nebraska, and Rachel (Dave) Aten of Blair, Nebraska; two step-daughters, Jennifer (Duane) Friend of Council Bluffs, Iowa, and Joi (Paul) Schwery of Panama, Iowa; two step-sons, Jesse Smith of Defiance, Iowa, and Jeremy Smith (fiancee, Kim Becerra) of Council Bluffs, Iowa; one brother, Derald (Marsha) Carter of Defiance, Iowa; two sisters, Violet (Don) Schneider of Colorado Springs, Colorado, and Sharon (Charles) Cape of Mesquite, Nevada; three grandchildren; 9 step-grandchildren; and other relatives and friends. Funeral services were held on Saturday, December 12, 2009, at the Burmeister-Johannsen Funeral Home in Harlan, Iowa, with Rev. Ted Sieck and Pastor Ron Rasumssen officiating. Serving as casket bearers were Paul Plumb, Jack Knudson, Dave Aten, Paul Schwery, Duane Friend, and Rick Mulligan. Burial was in the Harlan Cemetery in Harlan, Iowa. The Burmeister-Johannsen Funeral Home in Harlan was in charge of the arrangements. Condolences may be left online at www.burmeisterjohannsen.com. George C. Scott once wrote, ” The human spirit is stronger than anything than can happen to us.” I believe this is so true with Delles. I will remember his touching personality and unique behavior and that contagiuos smile. He had that uncanny ability to make you feel like you had been friends forever. The first time I met him I was a little wet behind the ears and trying to date his daughter. He could have chased me away with a .22 if he wanted but Delles was a great listener and this little simple attention made me feel welcome and kept me from filling my pants on most visits. Delles has created many memories for numerous people over his lifetime and he has for me as well. Family of Junior, you have my sympathy in your loss. He fought the good fight as we expected, as he would have said,”You can’t win them all”. A donation will be made to the American Cancer. Society. So sorry to hear about Jr’s. passing. I used to shell corn with him all the time. He was always quick with a joke and a cheesy grin. He will be missed.